Grapevine High School is an American High school located in the far northeast portion of Tarrant County in the affluent city of Grapevine, Texas. Grapevine has been categorized as one of the top 100 high schools a number of years in the United States of America by Newsweek magazine, and was named a 1999-2000 National Blue Ribbon School. Grapevine, Texas is the oldest city in Tarrant County Texas. Grapevine High School was established in 1907 when the previously established Grapevine College (a private boarding school) was designated as a state high school. The Grapevine College was at the corner of Austin and Worth Streets. The following year, 1908, Grapevine High School had its first graduate (one graduate). Grapevine High School’s first annual/yearbook was published in 1916. The original school colors were purple & gold. In the early 1940s when Grapevine initiated its first football team the colors were changed to red & white. In 1962 an election was held to determine if Colleyville and/or Southlake would consolidate with Grapevine High School to form an expanded District. Southlake voted to form its own school district and Colleyville voted to consolidate with the Grapevine Public Schools. The County Superintendent signed the document making the Consolidation legal in April 1962. In 1976 the high school colors were changed to red, white and blue in celebration of the Bi-Centennial of 1976. At that time the colors of Grapevine Middle School were red & white and Colleyville Middle School was blue & white. That same year the District name was changed from Grapevine Public Schools to the Grapevine-Colleyville Independent School District. 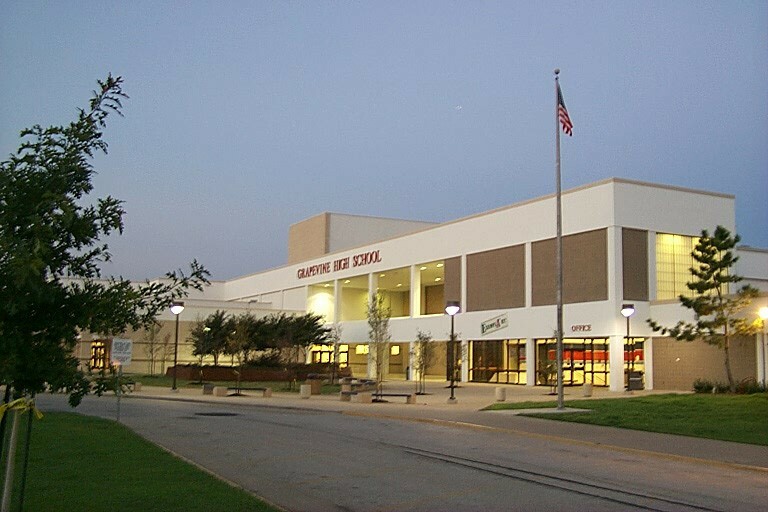 In the year 2007, Grapevine High School celebrated its 100th year centennial as a Texas public high school. The school mascot was originally the Mustang Grape, but when football was established the mascot changed to the Mustang horse. In 1938 the first elementary school was built on Austin Street through the Works Progress Administration (WPA) labor. Soon two additional wings were added to the structure along with the first gymnasium. A homemaking department structure was added in 1942. The 1950’s saw rapid development of the Grapevine Public Schools. In 1952 a new highs school building was constructed on E. Worth Street just east of Central Elementary. In 1954 the original high school was remodeled to become elementary space. In 1956, the new high school was extended to build a new homemaking department. In 1959 a Vocational Agriculture building was constructed. In 1962 construction started on a new cafeteria and band hall and the next year a second gymnasium was constructed. It was in 1969 that the new GHS was built and the old high school became Grapevine Middle School. GHS has one of the most active high school alumni associations in the United States. Annually, the Ex-Students Association awards college scholarships, inducts deserving former students and teachers into the Hall of Fame, runs the annual Homecoming Parade on Main Street through historic downtown Grapevine, and sponsors the Alumni Homecoming banquet. 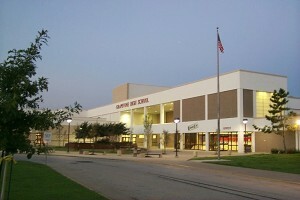 The Mission of Grapevine High School, an icon of tradition and innovative educational practices, is to intentionally develop knowledgeable, creative, ethical, and civic-minded leaders through high standards and personalized, relevant, and engaging learning experiences in concert with the community. There are three verses each to be followed by the chorus when being performed. Do we love her? Do we love her? Yes! Then we know they’ll make the day count, Victory’s with us to the end. When we think of Grapevine High, our own. When on you we so depend. We’re for you ’til the end.